For most of us here at Riverbend, working for a company with over 30 years of experience means we all spend our fair share of time drawing, reviewing, and/or reading timber frame floor plans. For most of you, chances are, even if you are pursuing the idea of building a traditional timber frame home, it is unlikely you’ve reviewed design concepts that included timber posts and truss work. 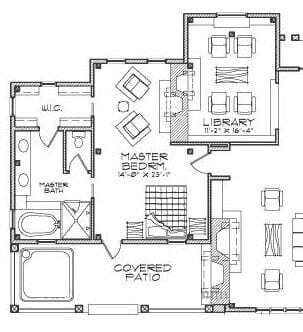 While you do not need to be an expert in reading floor plans, it helps to know the basics as you go through. Here are some pointers to help you discern what you are looking at. When you look at a floor plan, typically you will see double lines for walls and openings for doors with an arch symbolizing their path of movement. When you look at a timber frame floor plan specifically (see far left image), it will be easy to notice posts right away by their box symbol. These boxes will be intersected by dotted lines that represent where a timber beam or truss is located. 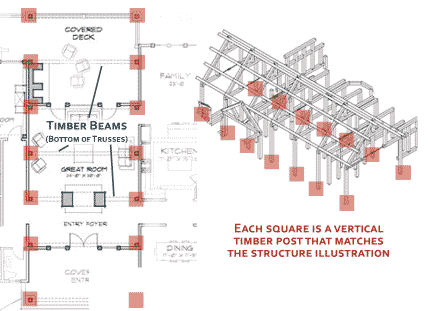 While this will give you a good idea of how much timber is in a plan and where it is located, it is as far as you can go with a floor plan layout. From there, you will look at a timber frame skeleton to see the timber framing itself. To achieve an accurate understanding of how the timber framing will come together, you can view a drawing of the timber frame skeleton. Above, the image on the right shows the timber frame skeleton that matches up with the floor plan seen on the left. By matching up the squares, it is easy to see how utilizing both of these images can help you begin to visualize how your interior spaces will look. There are several other things in a floor plan that are helpful to know when you review them. For instance, you will find that exterior spaces are represented by faint, single lines. Assessing the image on the right, you can also see things like how windows are represented by a break in the wall lines, or how a shower is differentiated from a tub with an ‘X’ through it and a door symbol arching inward. The structure of a double-sided fireplace and how it works into the wall system is also visible in the adjacent image. Hopefully, the explanation we have provided in this week’s blog has helped you to better understand the floor plans you view so that it is easier to get started on the customization of your own plan. Take a look at our floor plan gallery from more examples.